After losing in the first round of the regionals and the second round of the MACHA playoffs, the ice hockey club team hired alum Jerry Roberts. PAUL KLEIN TTN Senior captain Mike Roeding skates into the offensive zone and awaits a pass against The College of New Jersey. 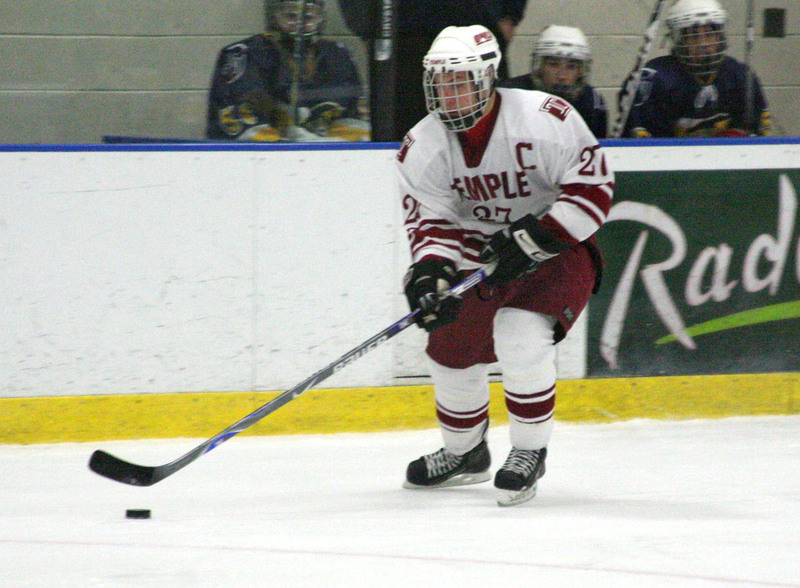 While the National Hockey League’s Philadelphia Flyers opened their season with a 2-0 shutout last Friday, another Philly hockey team, Temple’s ice hockey club team, kicked off its season with a 5-0 win over The College of New Jersey. The win marked not only the team’s first win of this season but also the first win for new coach, Jerry Roberts. Roberts is a Temple alumnus who played club ice hockey. He said it was a natural fit to coach here. Roberts played for the team when it won three straight Mid-Atlantic Collegiate Hockey Association (MACHA) championships from 2003 to 2005 and served as a scout under the previous coaching staff while also coaching area youth hockey teams. Roberts’ style differs drastically from the previous regime, which placed heavy emphasis on set plays and forechecks. “That may be good for a professional or semi-pro team, but for us, it didn’t work all of the time, and the philosophy of this coach now is about reading and reacting,” Roeding said. The new freewheeling style of play allowed the Owls to dismantle the Lions quickly in the first period, which featured goals from Roeding and sophomores Taylor Lockhart and Patrick McHugh. In the second period, sophomore Jordan Lawrence netted a goal, and senior Ryan Frain put an exclamation point on the night by scoring on a breakaway. The defense killed five penalties, including a five-on-three in the second period. Senior goalie Mark Berkheimer stopped 31 shots en route to the win. As the season progresses, Roberts said he and the older players have to work on developing the younger players. The current team makeup features more seniors and juniors than sophomores and freshmen. The younger players already appear poised to inherit the team, as three sophomores scored in Temple’s win over TCNJ. Last year’s squad lost in the second round of the MACHA playoffs and subsequently exited the regional championship in the first round. Newcomers contributed during 11-0 rout of St. Joe’s. Senior goalie has been an important asset this season.